Boeing named General Electric executive Kevin McAllister as the head of its commercial airplane unit Monday as part of a corporate reorganization that will add a third pillar to its sprawling aerospace business. Boeing intends to elevate its airplane services arm to be a major division on the level of its two premier divisions: defense and space, and commercial airplanes. The reorganization was unveiled Monday along with the announcement that chief executive of Boeing (BA)'s commercial airplanes unit, Ray Conner, 61, is leaving the post, effective immediately. Conner will be succeeded by McAllister, 53, who leaves as head of GE (GE)'s Aviation services business. The new Boeing Global Services unit will be headed by company veteran Stan Deal, 52, who currently runs Boeing's commercial aviation services business. The creation of the new dedicated services division has been a long-time ambition for the aerospace giant. Boeing, best known for building jetliners, fighter jets, rockets and satellites, has sought to diversify away from the ups and downs of manufacturing and tap into the steady revenue that comes from servicing aircraft throughout their multi-decade lifetime. 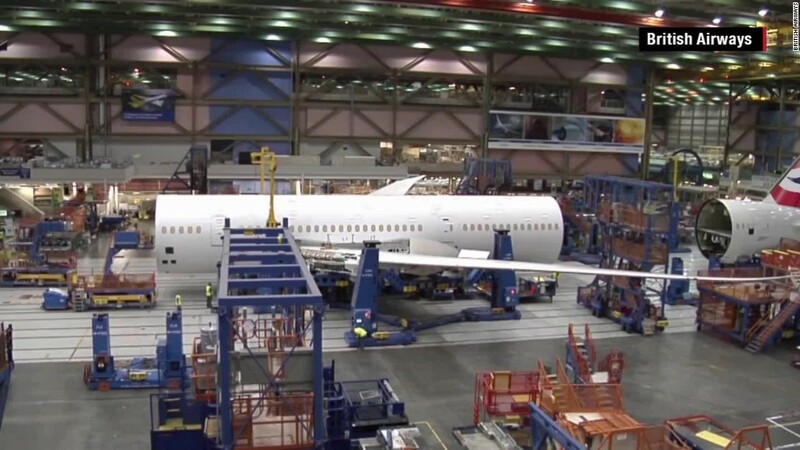 "Substantial services growth is core to Boeing's strategy," said Dennis Muilenburg, Boeing's chief executive. Selling services and spare parts to airlines, maintenance shops and governments is an increasingly lucrative business for the company. The company has plotted a steep expansion of its services business aiming to more than triple sales to about $50 billion by 2025, from an estimated $15 billion in 2015, according to Muilenburg. Boeing has less than 10% market share in the services operations at both its civil and defense aerospace businesses, providing "ample room to grow," he said. Muilenburg said the new services unit would be up and running in the third quarter of 2017 and based in Dallas. Boeing's push into the spare parts business threatens to further destabilize the business models of many of its own suppliers. Boeing's own suppliers rely on selling parts at a steep markup to airlines and other buyers to offset the lowest prices that plane makers receive when building airplanes on the assembly line. McAllister inherits a host of challenges at Boeing, including steep production ramp ups of its updated single-aisle 737 Max aircraft and introduction of its long-range 777X jetliner in 2020. McAllister will also helm Boeing as it weighs designing an all-new medium-range aircraft that wouldn't be ready until around 2025. Conner, a 39-year Boeing veteran who started as a mechanic building 727s and rose to company vice chairman, will retire at the end of 2017. In a letter to employees, Conner said he would continue to "stay engaged in the ongoing product strategy work that will shape the future of our airplane family." The Boeing Commercial Airplanes CEO role is as much an executive position as it is a U.S. diplomatic role, acting as a highly-visible figure representing the U.S.'s largest exporter at airlines around the globe. The appointment also further cements the relationship between Boeing and GE, which supplies most of its jet engines. Muilenburg's predecessor, Jim McNerney, spent most of his career at GE. McAllister's appointment as head of Boeing's commercial business is also a break with tradition. It marks the first time the company has tapped an outsider for that top job. "He's a great partner of Boeing, he knows us well," said Muilenburg.